Little Women by Louisa May Alcott was published in 1869. It is the story of four sisters: Meg, Jo, Beth, and Amy March. 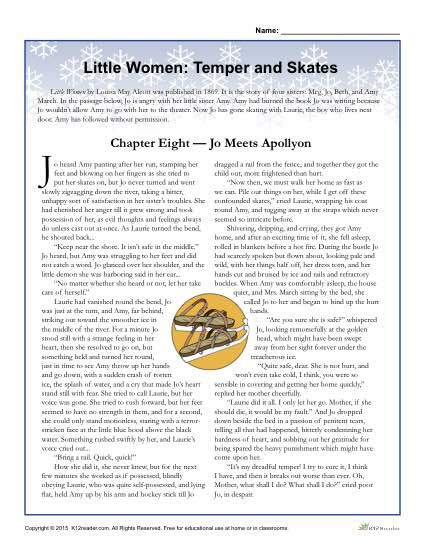 In the passage below, Jo is angry with her little sister Amy. Amy had burned the book Jo was writing because Jo wouldn’t allow Amy to go with her to the theater. Now Jo has gone skating with Laurie, the boy who lives next door. Amy has followed without permission. This activity set includes several different worksheets students use to practice skills in reading comprehension, vocabulary and more.